What should you do with a day in Berlin? We tailor unique experiences and private guided tours of Berlin to help you make the most of your time in our extraordinary city! For individuals, families, groups, schools and companies. Experience the city - understand the history. Finding your feet in a foreign city can be as daunting as it is thrilling. With each junction the option between something authentic and undiscovered, and, well, a wrong turn. We’re here to share our expert knowledge of Berlin with you; the sights, the stories, and the security of knowing there’s no reason to fear you’re missing out on something better. We have spent years acquiring the knowledge and insight that informs our internationally renowned private tours. And we love sharing it with you. We also recognise that knowledge, however deep, is only one part of the equation. That’s why we pay special attention to the little details. Our guides are all members of the Berlin Guides Association with years of professional experience and passion for the city and its history. Our drivers are as dependable as the German engineering of their vehicles. Dig deeper. Experience more. Go further. 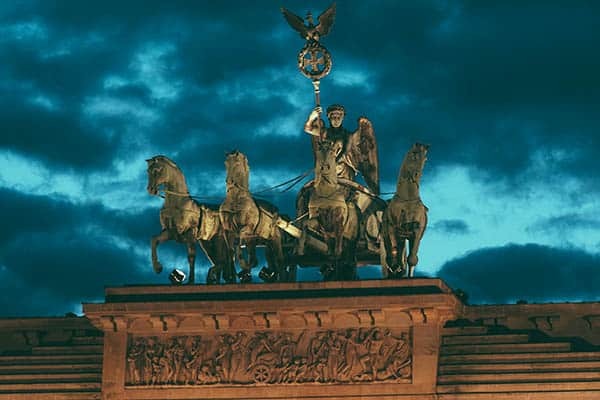 Whether you’re looking for an introductory sightseeing tour, expert historical tour exploring a particular chapter in Berlin’s unique history, a once in a lifetime opportunity to conquer the entire Berlin Wall by bike, or our attentive concierge services, we endeavour to provide the best personal and professional assistance possible – to make your Berlin visit exceptional. Let us take care of your trip – so you’ve got more time and energy to enjoy all that Berlin has to offer. Berlin is a great city to explore on foot - relatively flat and with many of the major historic sights within walking distance! Our tours can start anywhere in the city - with collection from your hotel/accommodation or at a centrally located landmark! For our private transportation tours, we only provide premium quality German vehicles (Volkswagen & Mercedes Benz) and drivers! Have a look at some of the posts from our 99 Berlin Experiences series. Insights into the must-do and must-see things in Berlin that have come to define the city. There is no more meaningful way of entering Berlin’s historic Mitte district than to walk through the central reservation of the Brandenburg Gate. This glorious neo-classical monument, erected by the Prussian Hohenzollern monarchy, would serve as the royal entrance into the capital of the Kingdom of Prussia. 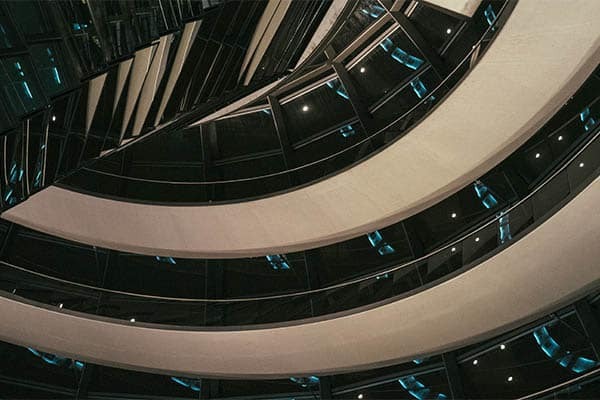 No other building but the Reichstag better stands to represent the troubled evolution of the German nation – and the distinctly introspective current political climate of the country. Due to the building’s position in the city, the roof and cupola of the structure also offer an exceptional panorama of Berlin’s skyline. 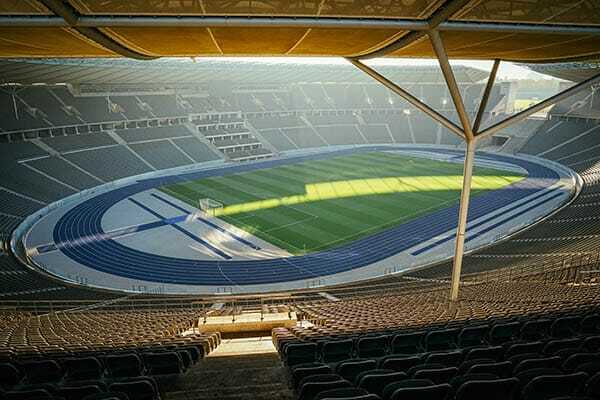 Despite its renovations and the passage of time, the Olympic Stadium still stand as testament to the imperial and totalitarian vision of the National Socialist era. In particular, the crude simplistic classicism of the venue’s design one of the best examples of an integrated, formalised architectural language of dictatorship in the world. 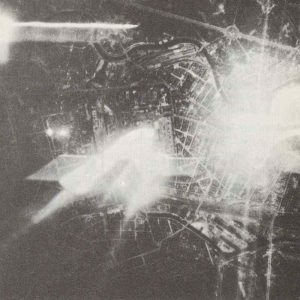 It was at this very minute (7:50 pm) 75 years ago today – on 22nd November 1943 – that the most devastating Royal Air Force raid carried on out the then-Nazi capital of Berlin began. Earlier this year, we covered the anniversary of the British Victory Parade that took place on July 21st 1945 – this month we take a closer look at the Allied Victory Parade of September 1945 when the four Allied powers gathered their troops to celebrate the defeat of Nazi Germany. 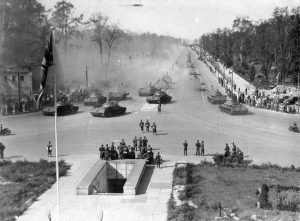 This month we take a look back at the Potsdam Conference. Seventeen days in the summer of 1945 that would change the course of human history forever. 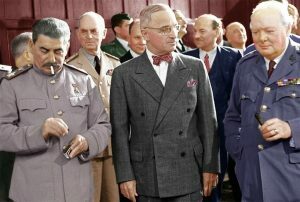 This would be the first, and last time, that US President Harry Truman, British Prime Minister Winston Churchill, and Soviet leader Joseph Stalin would meet. Allies united in the defeat of a common enemy. How do I make a booking with Berlin Experiences? First, have a look through our collection of tours and see what you are interested in. Using our Contact Form you can get in touch with us (we aim to reply to all requests within 24 hours) for a quote based on the type of tour you are interested in, the duration, the size of your group, and the seasonal availability. If you are interested in booking further experiences beyond what is already available on our website, feel free to contact us either via the Contact Form or at info@berlinexperiences.com and we can start making arrangements. 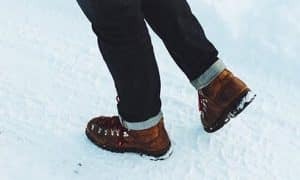 Who are the guides that lead your tours? We only work with the best professional tour guides in Berlin, all have years of experience and dedication to their work. All are members of the Berlin Guides Association, an organisation known throughout the city for its pride in guiding excellence. 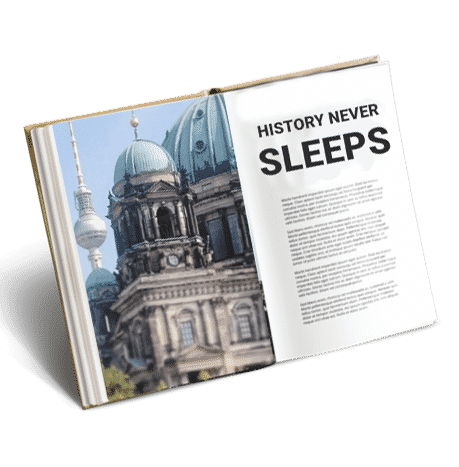 Depending on availability, tours are led personally by Berlin Experiences founder Matt (unless otherwise stated) however we have a great team of the best professional guides in the world, all specialists in their field, we work with. We can tailor each of our tours to fit your needs and interests. 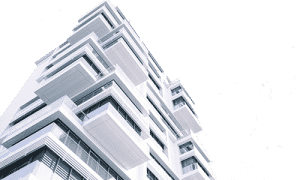 If your interested in the city go beyond the subjects stated on our site, we suggest sending an email via our contact form with all relevant information and we can draw up an offer with a suitable guide. Do we need public transportation for the tours? Our Premium tours are all conducted with fully air-conditioned premium cars/vans (usually high end Mercedez Benz or Volkswagen). Our Standard tours are designed for guests who prefer to walk but use of public transportation may also be necessary depending on the sites included in the tour. Public transportation costs are not included in our walking tours, but in the event that you need tickets we are more than happy to arrange the particulars. Are all the suggested sights listed in your classic tours covered on every tour? The itinerary sights listed on our tour pages are a general guide to what may be covered when booking those particular tours. We appreciate that every guest is different and approaches the city with different expectations and interests and tailor our tours accordingly. If you find something in particular that interests you then please do refer to this when contacting us so we can arrange your day accordingly. We are also happy to tailor our tours to combine sights (such as a Third Reich/Jewish Heritage day or Cold War/Berlin Highlights for example) on request. Our prices vary based on tour particulars such as duration, group size, guide, transportation options and season. As we only offer exclusively private tours (with no other tourists accompanying your group) we do charge more than public tour group prices. Our private walking tour rates start from 70€ per hour – with a three hour minimum booking. 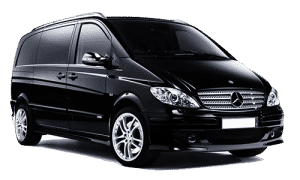 Private transportation tours we offer from 135€ per hour (Mercedes Benz Vito/Viano or Volkswagen Caravelle vans). We also have further options for luxury clients (Mercedes Benz S-class saloons) and large groups (Mercedes Sprinter Vans and larger buses). For more information get in touch via our email at info@berlinexperiences.com or the contact box at the bottom of this page. Is there anything that I should bring for the tour? We offer our tours every day of the year. We always suggest guest come prepared for the season – a hat and gloves in the winter, sunglasses and sunscreen in the summer. Please do check the weather before your trip, summers in Berlin can be rather hot and the winters can be rather cold. We always try to make sure our guests stay hydrated on tours, and include time for a short coffee/snack break on our shorter tours and lunch on our longer tours. However, a bottle of water is always a worthy travel companion. As referenced in our Terms & Conditions page, we do not offer refunds on bookings made closer than one month of the Tour, Itinerary or Excursion date. Bookings cancelled up to one month before the Tour, Itinerary, Excursion date will be refunded minus a 25% administration fee. Cancellations can be made via email to info@berlinexperiences.com. Can you recommend some places to stay/eat/party in Berlin? Absolutely! All of our guides are Berlin residents and have lived in the city for years, they are all well versed in letting their stomach lead the way to some of the best spots in the city. When touring in Berlin, feel free to quiz our guides about everything. If you need advice on where to stay or things to see/do before or after your tours please do send us an email. We are more than happy to help!